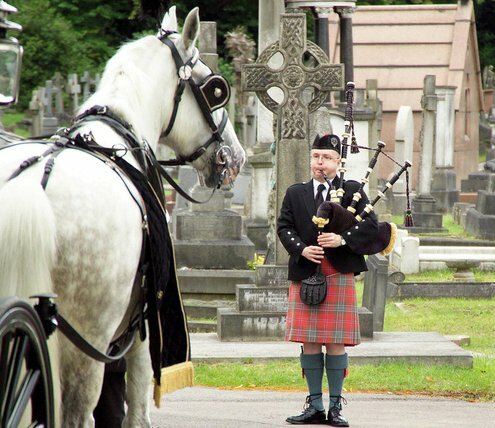 A Scottish piper in full Highland dress can provide a fitting farewell for a loved one. If you are looking for a bagpipe player in London, south east England and parts of the East Midlands and Eastern counties, this site can help put you in touch with a piper. 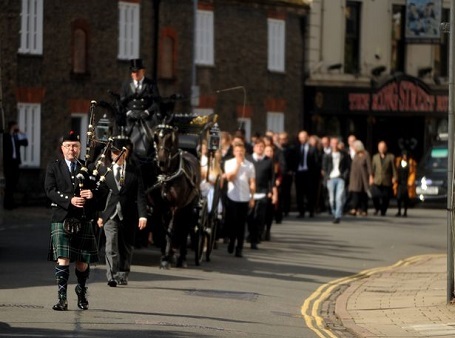 Your piper will be experienced in piping at funerals so will be familiar with the protocols of the day. He can speak with you before the service to find out how you want the bagpipes to be played. You can choose which tunes you want to hear, and the times when you would like them to be played. A piper can be instructed to play at times chosen by the bereaved family - perhaps just one significant tune at a particular point or, alternatively, at various times during the proceedings. Tunes can be selected from a wide range - such as Highland or Lowland Scots songs or perhaps melodies with military or geographic assocations. Many Irish tunes can also be played with the Highland bagpipe. Popular tunes include Amazing Grace, Skye Boat Song, Flower of Scotland. Traditional laments include Flowers of the Forest, Lochaber No More, Sleep Dearie Sleep. Gaelic airs include Soraidh Leis an Ait (Farewell to the Land of My Birth), My Home, The Mist Covered Mountains of Home. Irish melodies include Danny Boy, Fields of Athenry, The Galway Shawl. pipe a lament after the final words of committal. About this website - this site puts you directly in touch with a piper who can play for you. It is not an agency so you are not charged any commission or booking fee. You discuss the details of your service with the piper who will play for you - and you will not be charged for anything at any time by this website, even if you decide not to book the piper we put you in touch with. You are under no obligation to book any piper we recommend. Fees - are settled directly with your piper and may vary according to the individual piper. This site does not charge any commission or any other kind of fee, we just help put you in touch with the piper. 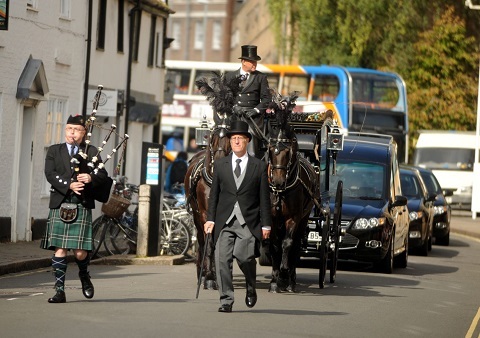 But we can answer any queries you have about using a piper at a funeral. As for method of payment, many funeral directors will pay the piper on the day (on your behalf) and add this fee to your account. This avoids the need to worry about handling money on the day of the funeral. Or you can arrange to pay the piper directly by an agreed form of payment. Any piper recommended via this website will be an experienced player who will have played in a top level pipe band, or as a solo competition player - or in the Army.